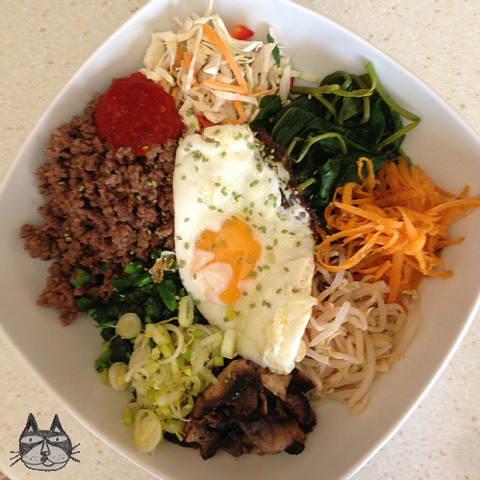 Bibimbap is a Korean rice dish, that literally means Mixed Rice. It is a bowl of rice that has various toppings individually prepared. The toppings are mostly vegetables, a fried egg and a portion of cooked beef and served with a spicy sauce/paste of chilli, typically a paste called gochujang, but since I didn’t have any when I made this dish, I served it up with sambal. You mix it all up in the bowl before you start eating. 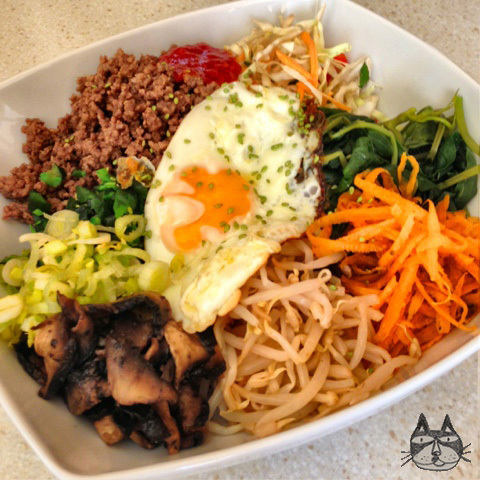 The first time I tried Bibimbap was here in Athens. I was wandering the city streets on my own a few years ago (exploring the city, looking for shops and just familiarising myself to the place) and I stumbled upon a Korean restaurant, Dosirak. They don’t only serve Korean food, but also Japanese – sashimi and sushi rolls galore. I was exhausted, hot (I still find the weather a bit difficult to adapt to here in Greece – extremely hot summer days is not my cup of tea), sweaty and hungry, I plopped in and took a seat by the window. And thank you Dosirak for introducing me to the wonders of Kimchi, Bulgogi, Bibimbap and everything else yummy from Korea. This is my ‘tribute’ to the wonderful experience I had all those years ago (a bit homesick, and very much in need of pick-me-up). It may seem like its a rather time consuming dish to prepare, like most Asian dishes are, but it may seem like it because of the various toppings – they are mostly side dishes that can be leftovers or ready-made like the pickles. 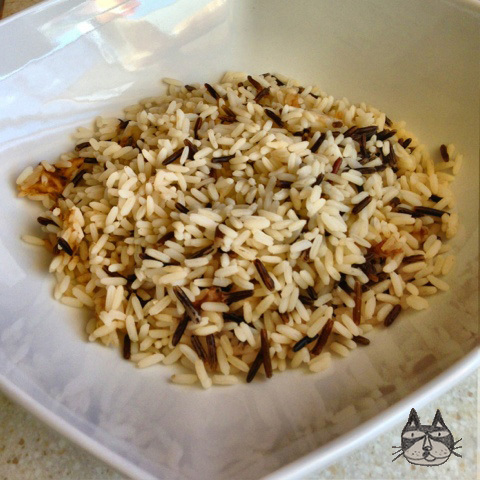 I decided to make a wild and long grain rice mix base for this dish – I love the texture the wild rice gives. I cook it normally but added a little bit of salt and olive oil while it was cooking. The vegetables toppings I prepared were kangkung (but you can use any leafy vegetable like spinach), bean sprouts, shredded carrots, shredded cabbage (as a replacement for kimchi), mushrooms, pickled cucumbers (I use kyuri no shiozuke which are salted pickled cucumbers, but you can replace with thinly shredded cucumbers or make your own) and spring onions (not pictured above.) I cooked the minced beef in a hot pan, and add it to the toppings, with a dollop of sambal and a sunny-side-up fried egg and a sprinkling of wasabi sesame seeds. Mushrooms, sliced thinly. (I used Portobello mushrooms here, but any mushroom would do fine. If you have Shiitake, that’s even better!). 4 eggs, fried sunny side up. Hot chilli pepper paste: either Guochujang or Sambal. If neither are available, a simple store-bought chilli sauce would do. To prepare the vegetable toppings, you are going to need a lot of minced garlic, sesame oil and vegetable oil. Cook rice according to instructions. Add a dash of salt and a spoonful of olive oil while the rice is cooking if you are using a wild rice and long grain rice mix. To make the beef, in a hot pan, add the minced beef and slightly brown. Stir in the other ingredients as it is cooking, and cook until all the liquid has evaporated. Cover to keep warm. In a hot pan, saute the vegetables separately with a tablespoon of sesame oil and a teaspoon of minced garlic. Eg. : add the sesame oil into the pan and add the shredded carrots and saute with the garlic. Use an additional teaspoon of vegetable oil for the mushrooms. 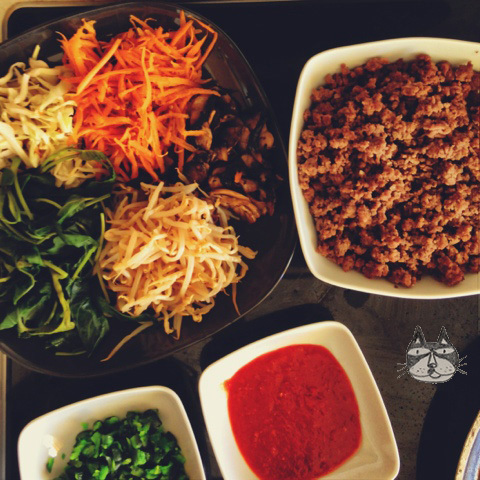 Arrange them all on a big plate to make it easier for you to assemble the rice bowl later. In a big bowl, add the rice at the bottom like the picture above. Add a spoonful of each topping onto the rice and arrange them neatly around the bowl. Add the egg on top, and scatter with sesame seeds. Finally, add a small dollop of the hot sauce (with an additional bowl by the side for people who like it HOT). Before you tuck in, mix it all up with a spoon, mix mix mix! Enjoy it with chopsticks or with a fork and spoon, but mixing the ingredients together well is the secret here!